You sell it, we ship it. Amazon has created one of the most advanced fulfilment networks in the world, and your business can benefit from our expertise. With Fulfilment by Amazon (FBA) you store your products in Amazon's fulfilment centers, and we pick, pack, deliver, support customer service and returns for these products. Best of all, FBA can help you scale your business and reach more customers. We store your inventory and take care of shipping to your customers saving you time so that you can focus on your business. Customers trust Amazon’s world-class packaging, shipping, customer service and returns—and your brand benefits. FBA’s flexible rate structure means you only pay for the services you use—no additional subscription fees, no minimum units and no start-up fees. FBA can help you scale your operations flexibly and without new investments in capital and employees. We can handle a broad range of product types and large volumes helping you realize your big plans. With FBA, we support customer service and returns for products sold on Amazon.in. Your products will be eligible for Free Delivery options available with Amazon. With Cash on Delivery being extensively used in India, you can fulfill your orders using Cash on Delivery facility through FBA. With Fulfilment by Amazon, (FBA) you store your products in Amazon’s warehouse, and we pack and deliver the orders to customers, provide customer service and handle returns. After you have been accepted to our programme, you will need to register our fulfilment centre as an additional place of business for you with the tax authorities. Then you will need to list your products and unit quantities in advance to be fulfiled. You prepare and label your products and packages for shipping. You ship your products to us. We receive and store your product units in Amazon’s fulfilment centre. We will ship your orders directly from Amazon’s fulfilment centre to the customers. 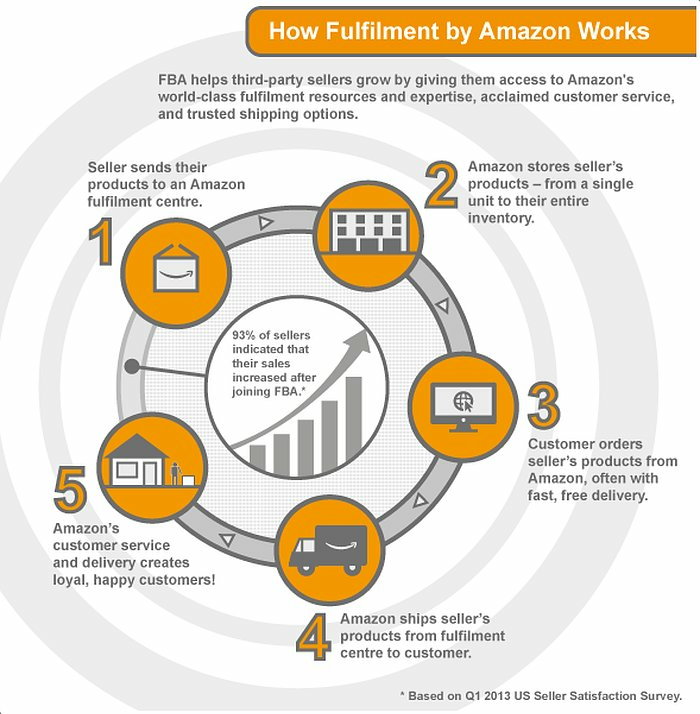 What are the benefits Fulfilment by Amazon (FBA)? Grow your business and put Amazon's proven fulfilment technology to work. Delight your customer with world class customer service to service your orders. No growing pains: FBA can help Sellers scale operations flexibly and without new investments in warehouse space and headcount. Amazon can handle a broad range of product types and large volumes. Can my FBA products be delivered to addresses outside of India? No, at this point we deliver to addresses within India. What are the categories in which I can use FBA? You can sell items in the following categories: Books, Movies, Mobile Phones, Personal Computers, Tablets, Consumer Electronics (including Cameras and Video Games - Consoles) and Accessories (including Mobiles Accessories, Electronic Accessories and PC Accessories). More categories are coming soon. Please Contact Us with the category information if you wish to participate in this programme. Do I need a list of minimum number of items? FBA has no minimum number of items required to use it. How can I participate in FBA programme? You can participate in FBA by providing your details through Contact Us link on the website. We will respond to you after reviewing your information with next steps. Once you are accepted to our programme, you will need to register our fulfillment centre as your additional place of business with the tax authorities. Do I need to register Amazon as an additional place of business? Yes. After you have been accepted to our programme, you will need to register our fulfilment centre as your additional place of business with the tax authorities. However, if you are selling only VAT exempted books, then this may not be required. Note that if you start selling any taxable goods under our programme you need to register under sales tax law adding our fulfilment centre as your additional place of business with tax authorities. Do I have to sell on Amazon.in to use FBA? Can I use FBA for fulfillment of orders received on my website? Yes. At this time, FBA is available to only sellers who sell on Amazon.in. Where are your fulfilment centres? Our fulfillment centre is located at Bhiwandi, outskirts of Mumbai City. Storage of your products in Amazon fulfilment centre. Increased exposure for your products on Amazon.in. Picking and packing of your products when a customer orders them. Shipping of your products to the customer. Customer service and returns supported by Amazon for products sold on Amazon.in. For more information about our fees, please refer Pricing. How will you bill me for Fulfilment by Amazon? We will deduct the FBA fees from proceeds credited to your Selling on Amazon account and withhold the fees from the disbursement of funds to you. Do you use a minimum weight or the actual weight of products shipped using FBA? Fulfilment by Amazon uses the exact weight to the nearest 500 grams. How do I upload my listings on Amazon.in? If you have a small number of items you want Amazon to fulfil for you, you can list them one at a time. Seller Central, our web interface for sellers helps you to select items in the Amazon.in catalog or add new ones. Once you have your items listed, you can simply convert it to by fulfiled by Amazon. If you have large number of items, you can list items by uploading a flat file through our web tool. We provide an Excel spreadsheet template that you can use to build the file. This method enables you to directly list them for Fulfilment by Amazon. If you have large number of items and development resources available to you, you can integrate your own website or inventory management software with Amaon's inventory catalog. This method enables you to directly list them for fulfilment by Amazon. What product and order information you need from me? How do I pack products for shipment to you? Collect your packaged and labeled units and pack them in boxes to ship to Amazon fulfilment centre. Print shipping labels for your packages. You can print from your seller account the list of products and quantities you intend to send us and use this list as a reference when collecting the products from your storage facility. Pack your product units using as few boxes as possible. Protect the products from damage during shipping by adding cushioning material like styrofoam or bubble-wrap to the box. Check the sealed box to ensure the contents in the box will not shift during shipping and that the box is strong enough for shipping. Repack the box if necessary. How do I prepare units for shipment to you? Each unit you ship to us should be ready for us to pack and ship to customers. Fragile items need to be individually packed with protective material such as Styrofoam or bubble wrap. Why do I need to label my product? Each unit must be labelled so that the correct item can be picked from inventory in Amazon’s fulfilment centre and shipped to your customer. Labels also help in tracking units you have in inventory at Amazon’s fulfilment centres. Shipments that are received without proper labelling may be returned to you. You can print labels from your seller account. What is on a label? A label has a product identifier specific to Amazon Fulfilment Services, including a barcode of the product identifier, item description, and item condition. Every unit must be labeled whether using the labels provided by your seller. How do I print labels for my products? How do I notify you of units I want to ship to you for fulfilment? Once you register a product type, you will enter the number of units of that product type that you want to send to us in your seller account. Then you will create a shipment in your seller account. Once you have shipped the units, you will set the shipment to Mark as Shipped. How can I manage my inventory in Amazon’s fulfilment centres? You can monitor your inventory levels online in your seller account. If you want to send additional units to increase your inventory levels, you will need to inform us of additional product unit shipments you want to send to Amazon’s fulfilment centre. See below for more information related to customer returns and inventory returns. Will Amazon compensate for any lost or damaged units? If a loss of or damage to any Unit occurs in circumstances for which we take responsibility under the Amazon Services Business Solutions Agreement, we will reimburse you. Can I arrange direct shipment of inventory to Amazon from overseas suppliers? Yes. We can receive inventory that originates from overseas. Sellers with shipments that originate from overseas will need to arrange the import and customs clearance of the shipment and then arrange for the delivery to our facility. We will not serve as the importer of record or ultimate consignee on any of your imported freight. We will not be responsible for any duties, taxes or other charges associated with the importation of your freight. We will not provide tax ID numbers to you. We will not provide brokerage or freight forwarding services. You are responsible for compliance and filing with all applicable other government agencies at the time of importation. You must provide prepaid delivery to Amazon’s fulfilment centre and the products should arrive stickered. Will my products be safe in Amazon’s fulfilment centre? 24-hour security staff in fulfilment centre. Fully automated wireless and computer-networked order tracking throughout the facility. Who will handle customer service? One of the advantages of fulfilment by Amazon is the use of Amazon’s customer service to handle customer enquiries, refunds and returns. If the customer wants to return a product, we direct the customer to our online Returns centre. Our online returns centre provides customers with help pages and details about how to contact us. Who will handle customer returns? Our online returns centre provides customers with help pages and details about how to contact us. If the customer wants to return a product, we will direct the customer to our online Returns centre. Once the customer raises a return request, we will handle the customer returns. How will customer refunds happen? For products sold by you through the Amazon.in website, we will process the customer refunds for product returns in accordance with Amazon.in returns policy, the FBA service terms and the selling on Amazon Service terms. Your selling on Amazon report will show these refunds. What happens to customer returned products? If we determine the product is no longer sellable in the same condition as previously listed, we will flag it as damaged in your seller account and will hold it temporarily. If you do not tell us within 90 days whether you elect to dispose of the unit or have it returned to you, we may choose to dispose of or return it at our discretion. If we determine the returned product is still sellable in the same condition as previously listed, we will automatically place the unit back into your inventory available for sale. What do I do with unfulfillable inventory? You can request that your unfulfillable inventory be returned to you. You will need to contact us to set up a distributor return for the inventory you no longer want to be fulfilled by Amazon, including unfulfillable inventory. How do I ask you to return products (unfulfillable inventory) to me? SKU of each item to be returned. Quantity of each item to be returned. Address to which you would like us to send the items. We will start processing your return request once we receive this information. We will send you an e-mail confirmation once your items are packed for shipping. Typically, return requests take 10 to 14 business days to process. There is a removal fees of Rs.10 per unit for Standard-Size Media products.